What is a lazy type? In object-oriented programming, a type describes a set of objects equipped with certain operations. Classes are implementation modules that define types in a given programming language. A class sets up a single structure and behavior that are then common to all the objects directly belonging to the class. Object behavior might be redefined in subclasses but it is established beforehand for a given class. A lazy type is a type whose structure and behavior dynamically adapt themselves to the available data at the instance level. A lazy type includes a set of attributes and a set of methods, as usual in object-oriented programming. 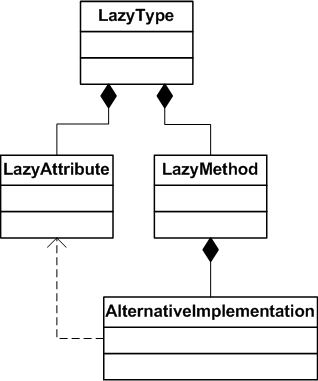 However, lazy type behavior is described by means of alternative method implementations for each method. A lazy object will only incorporate the attributes it really needs at each moment and its behavior will change accordingly. The invocation of a lazy method calls one of the alternative implementations according to the object current state. The implementation used will depend on the data each method alternative implementation needs. If a given attribute is not available and a method implementation needs that attribute value, then that alternative implementation will not be called. The alternative that fits the current object state will be automatically invoked. Since alternative method implementations share their signatures, the lazy type maintains its external interface and the programmer can transparently use lazy objects as if they were conventional objects. Let us suppose that we want to create a lazy triangle, i.e. a class representing a triangle so that we can automatically compute its area given some of its geometrical properties, even when we do not know which piece of information will be available at each moment. Lazy types define classes with alternative method implementations so that a suitable method implementation will automatically be invoked on an object depending on the object actual state (and we do not have to worry about the conditional logic needed to choose the proper implementation alternative!). We would also define the corresponding getters and setters methods for all instance variables (or the equivalent properties in C#). Please, take into account that the method must be declared virtual so that the lazy typing framework will be able to replace its default implementation when needed. Here, we have declared three public methods using the [AlternativeImplementation] attribute provided by the lazy typing framework. These methods represent implementation alternatives to the Area method. Please, take into account that their signatures match the Area method signature. We could have declared the above alternative implementations as protected methods. In fact, that's what we should do not to modify the public interface of the lazy class whenever a new alternative method implementation is defined. Once the object is created using LazyFactory.Create(), the proper method implementation will automatically be invoked every time we call the Area method on the triangle object. Please, check the accompanying NUnit tests file to see how different object states transparently lead to different implementations for the Area method. The full source code of the lazy Triangle class is also available here. The previous example shows how lazy types work but does not reflect how lazy types might be used in practice, so we introduce another example in the following section. The demand of a known good can be approximated as a function of its price in the market. 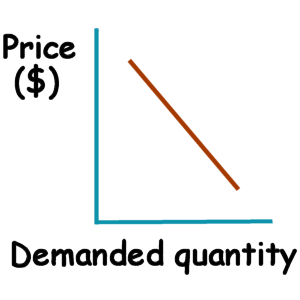 The higher the price, the lower the product demanded quantity. The lower the price, the higher the product demanded quantity. The figure below shows how the product and its demanded quantity are related in the market. Now we have a truly flexible Demand class that we can easily incorporate into more powerful economic analysis applications. nicely fits a complex problem where the existence varying amounts of data, maybe from different sources, would make our design much more complex if we did not have lazy types at our disposal. The full source code of the lazy economic analysis case study is available here. Some NUnit test cases for this case study are also provided here.